For those that enjoyed last week’s flat run along the snowy sidewalks of Melrose and Wakefield, you’re in for a treat this week. You’ll get 4 more miles and giant snow banks to contend with. This week’s run extends the miles again, up to 14.6 for the long run and 7.1 for the shorter distance. Seriously there will be little room on the side of the roads so try to stay single file and hug the giant snow banks. This week we’ll be running the old Melrose Half Marathon route. Long before Boston’s Run to Remember moved to Boston, it used to be the Melrose Law Enforcement Memorial Half Marathon. It was organized by the Runner’s Edge running store which existed in what is now the Melrose Marathon Sports location. The run will take you up Main St, past Ell Pond and the Clarence DeMar statue (give it a tap for good luck if you can get to it). Take a left on Melrose Street and another quick left onto the LynnFells Parkway. As you pass Melrose High School you’ll be passing the starting line of the Half Marathon. As you reach Tremont Street the full distance runners will turn left on Tremont, the short distance runners continue on straight. For the full distance you’ll do a loop of the Ell Pond neighborhood, taking a left whenever you hit a street: left on Lake Ave, left on West Emerson, left on Main Street, left on Melrose Street, left on LynnFells Parkway. Now you’re back across the start and you’ll continue straight on the LynnFells Parkway. Yes, the official Melrose Half Marathon started with a loop around Ell Pond. Now that everyone is on the LynnFells, go up and over a hill and you’ll find a water stop at Grimsbys. After Grimsbys continue on the LynnFells to Fellsway East. This part should be familiar, we ran it two weeks ago. Enjoy the snowy scenery of the Fellsway East as it takes you up and over two beautiful (long) hills. Keep runnint through a set of lights to a rotary at Highland Ave. Take a right on Highland and follow that towards Spot Pond. You’ll find another water stop on your left before the next rotary. After that water stop, if you’re running short stay right at the rotary along the front side of Spot Pond. Take a left on Pond Street back down to Grimsby’s. Continue straight past Grimsby’s along West Wyoming Avenue to Main Street. A left on Main Street will bring you home to Brueggers. In for the full? Go left on Elm Street at the rotary and circle Spot Pond. You do that by taking a right on Rte28, Main Street to Stoneham. You’ll go up what we’ve dubbed Slacker’s Hill… if you’re walking, you’re slackin’… under I93, past an onramp to I93, over I93, past an off ramp from I93 before reaching Straw Point. Take a right into the parking lot of Straw Point (If you hit Friendly’s and a Mobil Station you missed your turn and a water stop, but if you take a right there it’ll get you back on the route). St Straw Point have a little sip of water and continue on around the pond. Right onto Pond Street, past Spot Pond (look for the wolves, they sometimes do their own Sunday Run up on the hills), along the front side of the pond up past the Flynn Hockey Rink, through the rotary and back to the second water stop. From there you’ll take a left on East Border Road. This short steep road will take you to a set of lights at the Fellsway East. Left there, through the hills again back to Melrose High School. The race would end with your hill depleted legs having to take a loop around a track that existed at the Middle School. You’ll be spared the onlookers watching you eek out the last quarter mile. Instead you’ll have to run up to Melrose St, take a right up to Main. A right on Main Street will take you back to Melrose Center where Melrosians get to spy your hill depleted legs take you back to Brueggers. This was a challenging Half Marathon, and the hills haven’t gotten any smaller 15 years later. Celebrate with a bagel and a cup of coffee. go home and take a nap so you can be wide awake to watch the Patriots in the Super Bowl! So water stops. There are three, but two people can handle them. I’ll need at least one volunteer to cover this, or someone to drop their car at Highland Ave and a friend to pick them up and bring them to the start. Who can help? Ok, who’s in the for this Super Bowl Sunday Run? ROLL CALL! No, I’m not talking about the mysterious loss of air pressure in the footballs used in the AFC Championship game (which everyone won’t stop talking about), I’m talking about the recovery week miles you have ahead of you this week. Last week’s long run was a hilly, challenging 12.5 miles around Spot Pond. This week we have a flat 10.7 miles up and around Lake Quannapowitt in Wakefield on tap. The Shorter distance also has a step back week. After 7 miles last week you’ll be doing 6 this week. The route, as usual, starts at Brueggers. You’ll head north on Main Street past Ell Pond (don’t forget to give the Clarence DeMar monument a tap for good luck). Keep heading in that direction into Wakefield. As you approach the North Ave intersection where Dunkin Donuts and Jiffy Lube are, you’ll find a water stop on the right in the Nick’s Pizza parking lot. Have a drink and keep on moving. If you’re running short, turn around and head back to Brueggers. Simple as that. Running long? Keep heading up Main Street through Wakefield Center. Stay to the right on Main Street as you run along the east side of Lake Quannapowitt. Hug the lake with a left turn on Rte 129, and a left turn into the Converse parking lot. There may be snow on the ground so using the path to cut between the office buildings and the lake might not be an option. If not follow the road around, if its clear though feel free to follow the path. Keep running through the lot until you come out to North Ave. Take a left there. North Ave will bring you to a softball field at Church Street. Turn left there and run until you get to the church. Take a right there at the Wakefield Common onto the aptly named Common Street. This will merge you back onto Main Street and back to the water stop at Nick’s Pizza. Have another drink. From there its straight back Main Street into Melrose and into Brueggers. Water stops. There’s only one this week. I’ll handle it, but will gladly take any help I can get. It sounds like its going to snow on Saturday so expect slippery conditions Sunday Morning. Be careful, stay on the side of the road, run smart! Ok, Who’s in for the Miles Deflation Run of 2015? Roll Call!!! Last week we ran on Saturday through some cold winter winds out to Breakheart and back… and then the Patriots won a playoff game. Sunday the Patriots will play in the AFC championship game so you must go run a long run again. Seriously. You must! This week we’ll head out in the opposite direction from the first two weeks, down Main Street towards Malden. We’ll turn right onto West Wyoming Street and run to Grimsby’s… like we do on the summer route. At Grimsby’s we’ll turn left though and head over to the Fellsway East and roll up and down the hills of the Fells. 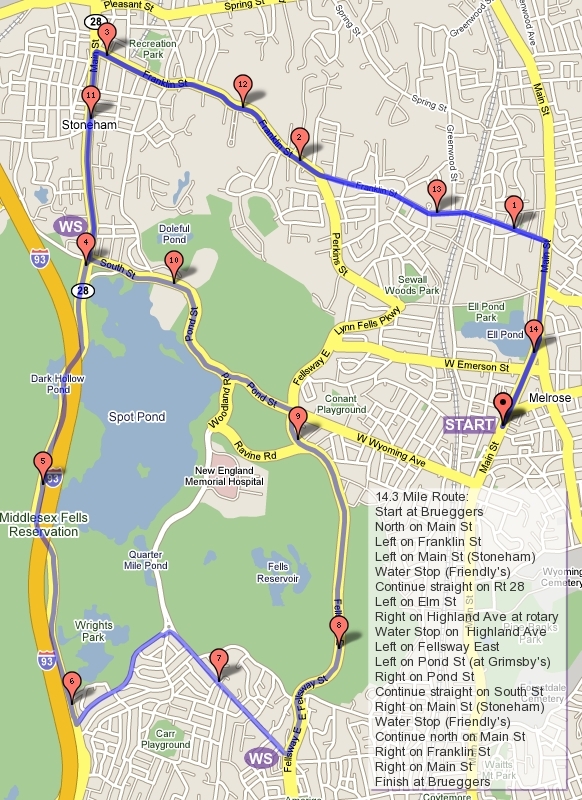 Keep running until you get to the rotary at Highland Ave, where you’ll take a right and head up towards Spot Pond. Just before you get to another rotary near the Flynn Rink you’ll find a water stop. Stop. Have a drink, maybe a snack, and then head off for more running. If you’re running short you stay right at the rotary, past the hockey rink and along Woodland Road to Pond Street. Take a right on to Pond and a left at Grimsby’s on to the LynnFells Parkway. Keep running the LynnFells past Melrose High School. Take a right on Melrose Street and a right on Main Street and before you know it you’ll be back to Brueggers with just over 7 miles under you belt! Running long? Go left at the rotary on to Elm Street. Circle Spot Pond by turning right on Rt 28 (Main Street), cutting through the parking lot at Straw Point on your right just before you get to Friendly’s, and following Pond Street past the Stone Zoo and Woodland Road up to the Flynn Rink. Next go around the rotary again until you’re back at the water stop. After your second stop you’ll head up Highland to a quick left on East Border Road. This little hilly road will take you back to the Fellsway East. Go right through the hills again and you’ll pass Grimsby’s and find yourself on the LynnFells Parkway. Follow the footsteps of the shorter route runners past Melrose High School to Melrose Street. A right on Melrose and a right on Main will get you back to Brueggers after you’ve done about 12.5 miles. Those are the routes. Water Stops? I’ll do one. A volunteer or two would be helpful. Anyone? So who’s in? ROLL CALL! This week we’ll be running on Saturday to get our run in before the MRC Holiday Party on Saturday Night. We’ll still be at Brueggers at 8AM but be wary that (1) they have more customers on a Saturday Morning so PLEASE stay out of the way of their customers in line and (2) there are more cars out on the road on a Saturday Morning so be extra careful to stay on sidewalks or in single file along the road side. Last week we had 29 runners make there way through Melrose, Saugus and Wakefield… as well as through slush and rain. While its snowing right now, I hope things are more comfortable than that this week. It’ll be colder but much drier. This week’s run is once again up Main Street to Green Street with a right onto the Lynnfells Parkway. Follow the parkway all the way out to the Saugus entrance to the Breakheart Reservation on your left. Run up to the parking lot by the headquarters of Breakheart where you’ll find water stop 1. After a small break in Breakheart, if you’re running short, turn around and head back the way you came for a 6 mile run. If you’re running long head into Breakheart along the path to your right. When the path forks at the pond inside the reservation, bear right to follow the outer loop. Continue around along the paved path through some very challenging hills until you pop back out at the parking lot. The same water stop will still be there. Once you’re done with your second stop, now you head back the way you came. I will once again cover the water stop duties this week, with some help from Jeanne I believe. So who’s in for this Saturday edition of the Sunday Long Run? Week 0 – Happy New [Training] Year, 2015! It’s 2015, time to hang up your new calendar and start marking down those big race dates. Do you have a half marathon, full marathon, ultra marathon to jot down? If so, mark the next 15 Sundays down, you have a date with the MRC SLR crew! (1) Sunday’s 8AM Brueggers – except when there’s an MRC Winter Party (Sat 1/10) in which case we’ll run Saturday morning instead. (2) Bring $2 if you’re running the long route, $1 if you’re running the short route. (3) Look at the map before Sunday Morning. We’ve never lost anyone (that I know of) but I have seen runners wandering off. Know the route! (4) Post to this blog if you’re coming, it helps us know how to stock the water stops. I’m helping you out, you can help me out by doing this one little thing each week. (5) Volunteers. I would like a volunteer for each water stop each week. It makes things easier for everyone. If you running you can still help by parking your car at a stop and finding a ride to Brueggers, I’ll throw supplies in it while you’re running. (6) Brueggers graciously lets us meet in their place of business before each run. Respect their business, do not block the counter or the doors. Stay quiet. Clean up after yourselves, tables and bathrooms, and remember no pets are allowed in their store . Also patronize their business: you’re hungry and thirsty, please eat and drink their products whenever possible. (7) Its cold out, so when I bring you outside to go over the route please stay quiet and listen. You’ll have plenty of time to talk when you run. (8) Stay in single file or two abreast, do not bunch up in a wide group into traffic. Just because you see a car does not mean they see you… especially early on a Sunday Morning. We start this Sunday with Week 0 of the 15 week program. Why Week 0? Boston sometimes falls on the 16th Sunday of the year. When that happens we start a week earlier with Week 0. We’ll start from Brueggers and head up Main Street towards Wakefield. Pass Ell Pond where you’ll see a monument to Melrose’s greatest marathoner, Clarence DeMar. After Ell Pond, cross over and veer onto Green Street. At the LynnFells Parkway turn right. Run to Main Street in Saugus (the next set of lights) and turn left. If you’re running short take your first left on to Howard and head back to Green Street. At Green take a left and follow it back to Main and back to Brueggers. Running long, keep following Main Street, it will become Farm Street. Wakefield High School will be on your right, that’s where you’ll find your Water Stop. After the water stop continue up to Water Street, a T intersection, and turn left. Water Street will bring you into Wakefield Center where you’ll turn left onto Main Street. Follow Main until you make it back to Brueggers. Ok, time for the Roll Call. Who’s in for the first Sunday Long Run of 2015? !